The year was 2040 and south Norman was ravaged by a storm of tornadoes, destroying nearly all of the University of Oklahoma’s south campus. 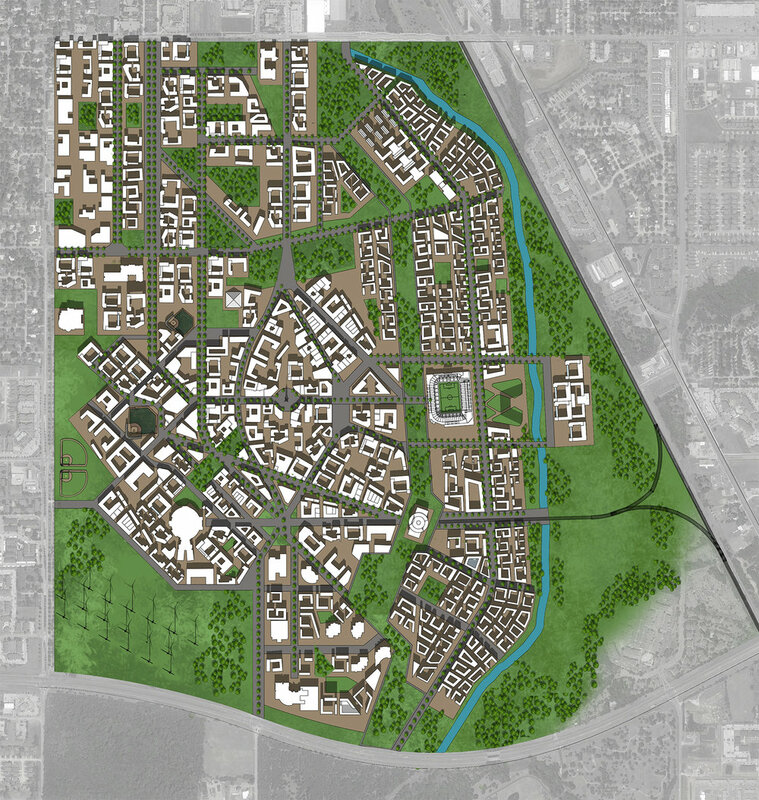 To rebuild this community, University of Oklahoma president David Boren Jr. began to look at a new master plan to rebuild the community for 2050, named Oculus City. The master plan aims to create a vision for the next 25 years that would enrich the legacy of the campus while creating a physical environment that is equal of the academic environment. 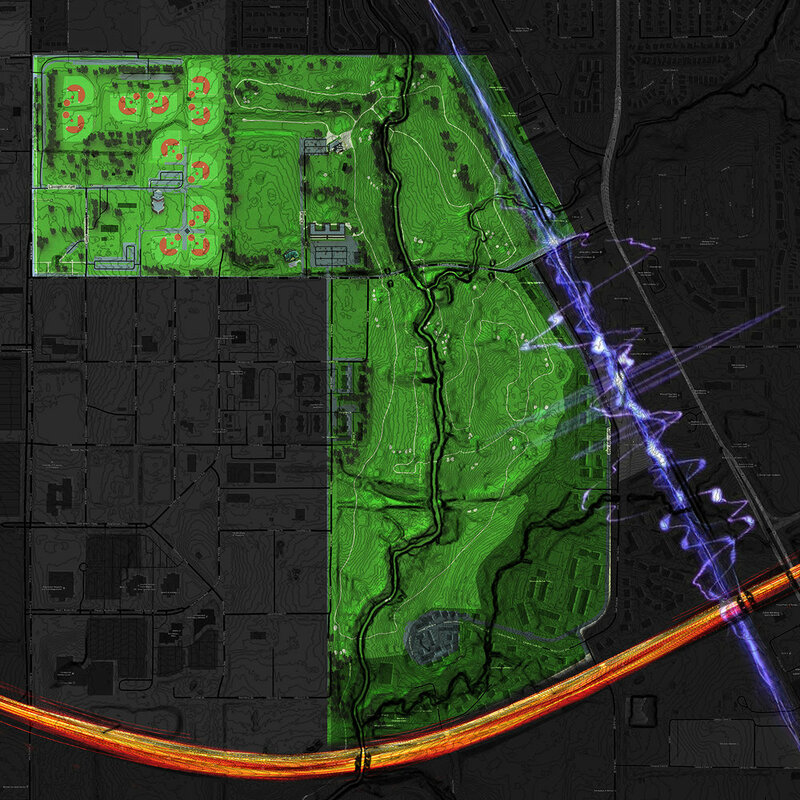 The process of creating the master plan of Oculus City began with a series of urban mappings for the current site that organizes information of the existing and past conditions. 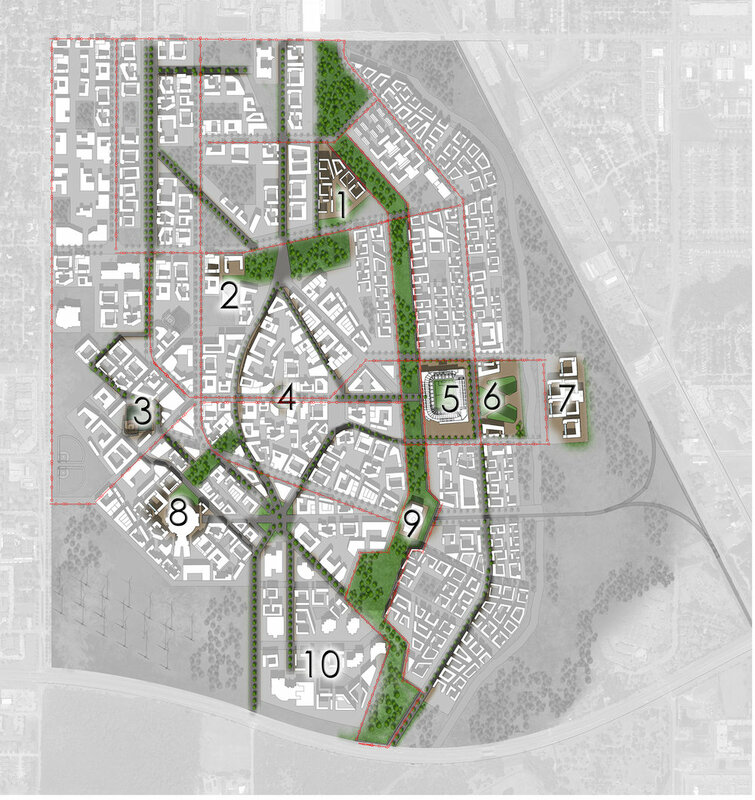 The result is a well-designed master plan that emphasizes the human scale to generate healthy streets that will support local business owners and keep the people of Norman connected. ocated in the center of Oculus City is the Iris Complex, a great example of one of the central hubs that promote community connectivity through the use of mixed-use development, public buildings, and sustainable landscape design. The complex is constructed in four phases, with the final phase being the construction of a new mixed-use building to be used as housing and a community hub for the students of the University of Oklahoma. Completing the Iris Complex, at the intersection of Millennial Curve and Axis Avenue; this is where Arboria Library stands. The site is in Norman, Oklahoma and is bounded on the North by Lindsey St, the west by Chautauqua Ave., the east by the railroad and the Jimmie Austin OU Golf Course, and the south by Highway 9. 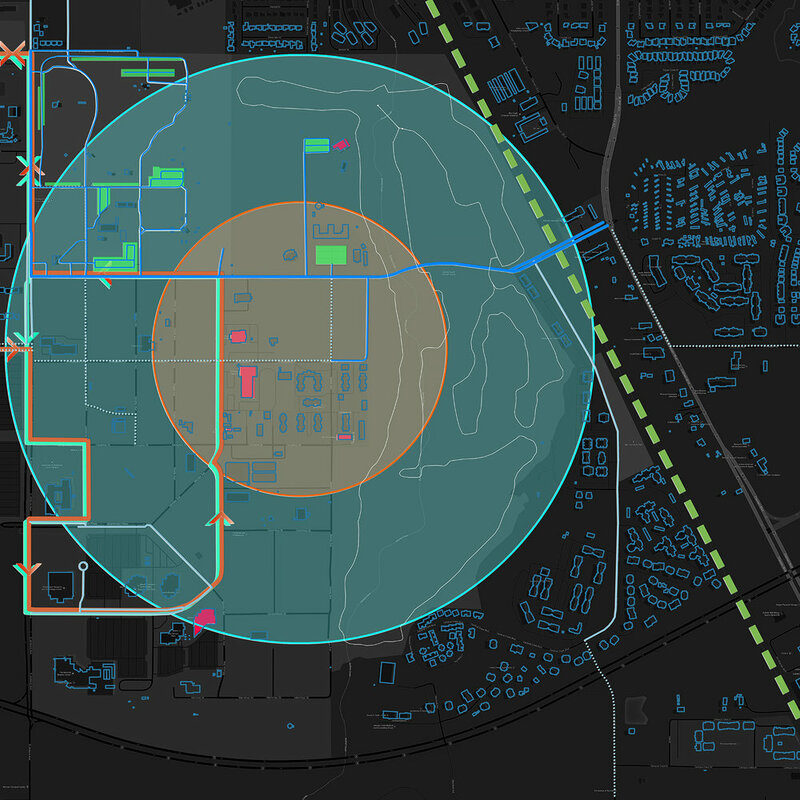 The large site is divided into 6 zones; below are some examples of the urban mapping and analysis for zone number 4.
he process of creating the master plan of Oculus City began with a series of urban mappings for the current site that organizes information of the existing and past conditions. In operation ‘Oculus City,’ the new football stadium is placed in the eastern corner of campus. The Multimodal Transportation Center sits directly to the southwest of the stadium, functioning as the main source of transportation throughout Norman. With the increase of gas prices, the desired need of the car has nearly diminished; the majority of the population relies on walking, bicycles and the integrated tramline. The center of the city acts as a town square; walking paths are bordered with multi-use buildings that include local shops and restaurants on the first floor, and housing above. The main pedestrian walkway, Millennial Curve, passes through the entire site, from the park space to the north, curving through the dense multi-use complex and terminating in a park space at the entrance to the football stadium. This densification emphasizes the human scale to generate healthy streets that will support local business owners and keep the people of Norman connected. This part of the project was assigned to groups of 2. Credit to Davis McDaniel for the help of the master plan design and the awesome sketches. Located in the center of Oculus city is the Iris Complex, a great example of one of the central hubs that promote community connectivity through the use of mixed-use development, public buildings, and sustainable landscape design. This complex also connects Millennial Curve, the city’s main pedestrian walkway, and Axis Avenue, the central street of the city. Following Oculus City Master Plan, the complex is constructed in four phases. Core buildings comprised of offices and public use buildings such as shopping centers are to be built in phase 1. During phase 2, new additions and expansions are to be built as mixed use developments to house the people of Oculus City. 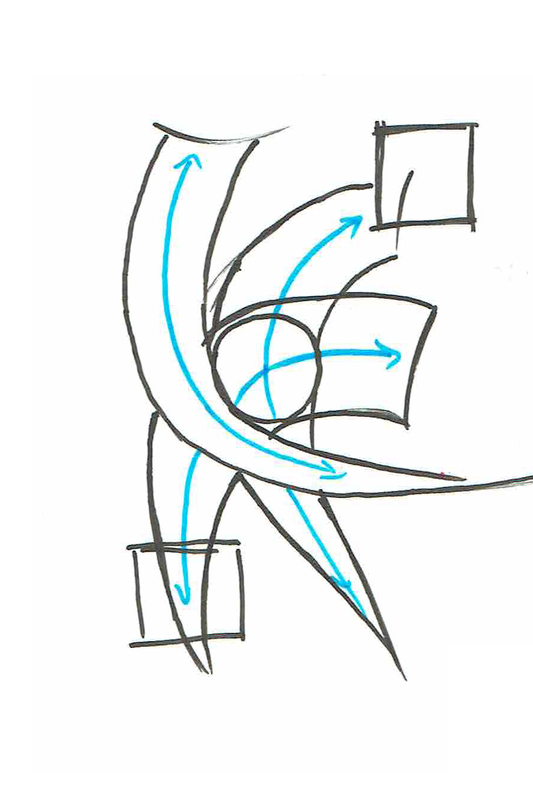 In order to unify the complex, sky-bridges are designed to connect the different buildings on site in phase 3. The final phase is the construction of a new mixed-use building to be used as housing and a community hub for the students of the University of Oklahoma. 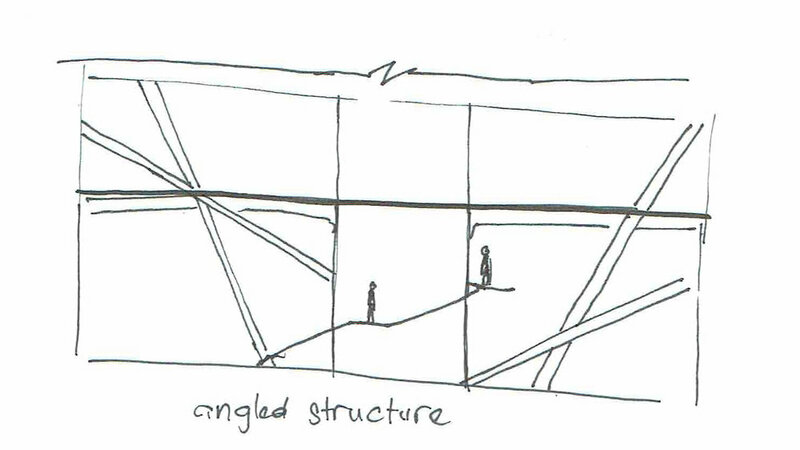 I approached the schematic design of this project through a series of parti sketches which document my investigations between architectural form and concepts that demonstrate context, structure, space containment, and organizational notations. Located at the intersection of Millennial Curve and Axis Avenue, Arboria Library is a six-story steel structure with the first four floors being a public library while the top two are high-end condominiums. Due to the two different types of occupancy, this building’s layout requires a clear delineation between public and private. 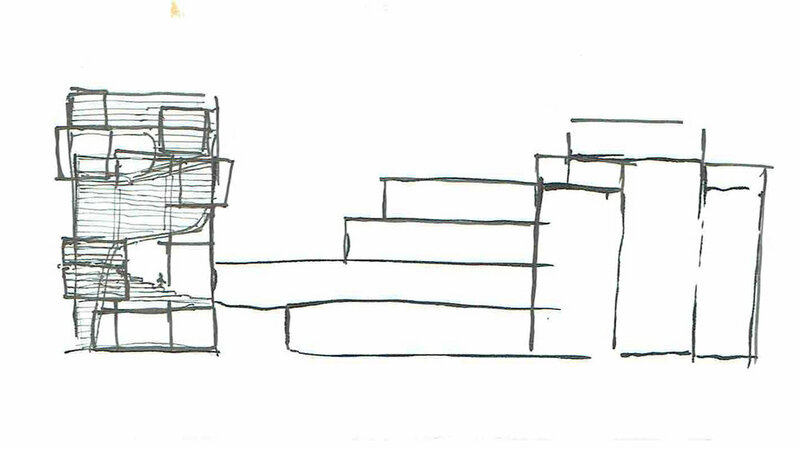 Vertically speaking, the public realm is on the first floor which gradually transitions to private as we go upward. Since the building is located in such a dense urban area, the library was designed to be less formal and more exploratory by focusing on how individuals will use the space instead of where to put the books. Starting on the first floor, the building’s entrance is recessed to create a shaded outdoor space that can be furnished with outdoor furniture or transit shelters to draw people in toward the building. s visitors enter the south entrance, they will be in the main lobby of the building that features an atrium which does not only provide natural daylight but is also used as a passive ventilation system. Upon entering the lobby, visitors will see the main circulation desk to their left, on the right is technical services which deal with new materials as well as book returns. From here they can decide to continue upward or toward the secondary entrance/exit on the northeast corner of the building. The second floor of the building consists of an area for children, which features a folding wall system that can fully open up and turn the space into a balcony/terrace. The location of this area will allow those who have kids to drop their children off here and continue on to other rooms and floors in this building. Also on this floor is periodicals and skybridge entrance to the building to the north. Of course there will be intensive security procedures (i.e. key cards, staffs), but the reason for this is to encourage the idea of bringing the inside out and the outside in. Essentially, we are not separating the usages, we are bringing them together. Continuing up the staircase to the third floor, visitors will get access to the reading room on the northwest corner, the fiction/nonfiction section in the southwest, and the reference desk in the south east. The fourth floor is where the technology garden, meeting room, and administration are located. This grand staircase does not continue to the fifth and sixth floor as they are used for condos which require privacy. For security and separation between public and private, there is also a lobby for residence located on the west side of the building. The residence will mainly use the vertical circulation in this lobby while the public will use the grand staircase that go up to the fourth floor.